In OS X Maverick’s Launchpad presents all the applications in your Applications folder in a view that looks like the home screen of any iOS device (that is, iPhone, iPad, or iPod touch). In fact, if you use one of these devices. 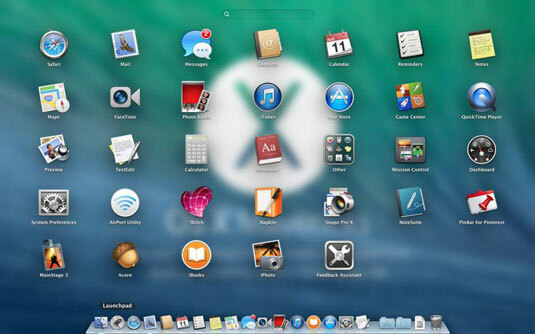 Click Launchpad’s Dock icon (shown in the margin). It fills your screen with big, beautiful application icons. The photo is actually in focus; the nifty blur effect happens only when Launchpad is active. Sure, it’s just eye candy, but it’s elegant eye candy. If your Launchpad has more than one page of apps, you can press Command+ left-arrow or right-arrow to move to the previous or next page. Trackpad users can also use a three-finger swipe left or right to move from page to page. To launch an app, just click its icon. In a heartbeat, Launchpad disappears, and the app replaces it on your screen. To rearrange app icons: Click and drag the app to its new location. *To move apps to the next or previous page: Click and drag the app to the left or right edge of the screen. When the next page of apps appears, drag the app to its new location on that page. *To add an app to your Dock: Click and drag the app onto the left side of the Dock. *To create a folder for apps: Drag one app’s icon on top of another app’s icon to create a folder. To add an app to a folder: Drag the app onto that folder to add it. *To move an app out of a folder: Click the folder to open it and drag the app out of the folder. To change a folder’s name: Click to open the folder, click the current name, and then type a new name. To uninstall apps: Click an app’s icon, but don’t release the mouse button until all the icons begin to wiggle. Apps that can be uninstalled display a Delete button (X); click to uninstall the app. Press Esc to stop the wiggling. If an icon doesn’t have a Delete button, it’s installed with OS X Mavericks and can’t be uninstalled. And last but not least, items in the Utilities folder (which you’ll find inside the Applications folder) appear in a folder called Other in Launchpad. Why? Who knows!